A major UK supermarket is tackling food waste with the introduction of a ‘smart label’ for its own-brand ham. Latest figures suggest that the common sandwich filling is no longer as beloved as it once was: British homeowners are throwing away 1.9 million slices every day, writes Jack Young. This is adding up to more than £170 million every year, according to the latest from WRAP figures, a programme that aims to help individuals, businesses and local authorities reduce waste and make better use of resources. 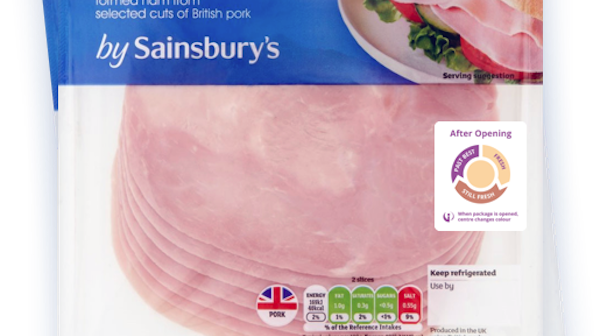 In an attempt to solve the problem, Sainsbury’s has introduced its Smart Fresh label, which changes the colour from yellow to purple to indicate how long the pack has been open. As an open pack of ham has its longest fridge-life when kept below five degrees Celsius, the new label is temperature sensitive, so the rate at which the colour of the label changes is designed to decrease depending on how cool the fridge is. To support Sainsbury’s Waste less, Save more initiative, the supermarket is trialling the new technology on its own-brand by Sainsbury’s seven-slice cooked ham, which is now available across all of its stores in the UK. The Waste less, Save more plan is a £10m, five-year campaign to encourage customers, and also communities, around the UK to reduce the amount of food they waste.